Autoship every 1 Month 2 Months 3 Months 6 Months and save 5% on every order! What's this? Energize and Reclaim Your Health Today With Detoxadine! What are the top 5 reasons you need nascent iodine? What did our customers say about our nascent iodine? Why is Detoxadine the best nascent iodine available? What are the top 3 questions people ask about Detoxadine? Detoxadine is Global Healing Center's certified organic, standardized nano-colloidal nascent iodine. It is produced with a transformative bio-elemental matrix and, with a glycerin base, is designed to be more gentle on your digestive system than iodine supplements that contain alcohol. Detoxadine is created from 300 million-year-old salt deposits located more than 7,000 feet below the earth's surface. It is an extremely pure nascent iodine that is both concentrated and free of additives and toxins. Each drop is loaded with 650 micrograms iodine and it's screened for radiation. Compared to any and all other iodine supplements, Global Healing Center's nascent iodine is the most easily absorbed and utilized form of iodine available. Read the reviews and compare for yourself, no other product can match! Each drop of Detoxadine contains 650 micrograms of iodine to promote the normal iodine levels necessary to support the thyroid and encourage normal hormone balance. Fluoride, chlorine, and bromine compete with iodine for the same thyroid receptors. Having enough iodine available helps defend and detoxify the thyroid against these toxic halogens. Unlike other iodine supplements which source iodine from the ocean, Detoxadine is created using 300 million-year-old salt deposits located 7,000 feet below the earth's surface. The result is an extremely pure and concentrated nascent iodine that is free of additives and toxins and also screened for radiation. Detoxadine is nascent iodine in a vegetable glycerin base. Unlike alcohol based formulas, it has an extremely gentle taste and is appropriate for adults and children alike. According to the World Health Organization, iodine deficiency is a public health problem in 54 countries. The CDC reports that iodine deficiency is one of the four major deficiency diseases in the world. The 2013 USGS iodine commodity summary warns that there is no substitute for iodine. According to UNICEF, iodine deficiency is the most avoidable cause of stunted physical and mental development. Promotes balanced iodine levels in adults and children. Encourages focus and a sharp mental state. Supports breast milk production and quality. Provides immune system support and defense against environmental toxins! Detoxifies mercury, lead, and toxic halogens like bromide, fluoride, and chlorine. What Are People Saying About Detoxadine? "The Most Advanced Iodine Supplement! Detoxadine is a high-quality daily nascent iodine supplement that will supply you with your recommended daily allowance! It's gentle on your stomach and won't sting or burn!" "I was hoping... I realize that it was a long shot, to see if it might help my condition, but unfortunately, it didn't. I tried taking it continually, and then stopped....absolutely no difference." We are sure you will see and feel the benefits of this nascent iodine. If you are not satisfied with your results, just let us know and we’ll send you a prompt refund. No questions asked. 3 drops = 1300% of RDA and one bottle will last the average person 3 months. Ultra pure nascent iodine is easily absorbable for optimal tissue saturation. Contains certified-USP grade iodine from an all-natural, deep earth source. Has a glycerin base with a mild, sweet taste, won't burn like alcohol! Never subjected to direct heat, harsh chemicals, or alcohol. Vegan-friendly, non-radioactive, and completely non-toxic! 1. Can I take Detoxadine while pregnant? Good nutrition is important, especially during pregnancy. Not only is an expectant mother providing for herself, but her developing baby as well. Many pregnant and planning-to-become-pregnant women use Detoxadine to support their health. 2. Why is Detoxadine better than potassium iodide? The nascent iodine in Detoxadine is pure and much easier for your body to absorb and use. In nature, iodine is attached to other elements as a compound, it doesn't exist pure. In these forms, absorption can be as low as 20%, making it biologically inefficient. Detoxadine is different because it provides a bioavailable, non-toxic nascent iodine that rapidly enters your bloodstream and disperses throughout your body. 3. How does nascent iodine affect my thyroid? The thyroid converts iodine back to mono-elemental iodine and immediately recombines it as an essential mineral element with protein configurations to form the thyroid hormones T3 and T4. Simply put, nascent iodine supports the thyroid and hormone function! Detoxadine is manufactured in a state-licensed facility that meets federal regulatory standards, is cGMP/HACCP-compliant, and lab grade. Raw elemental iodine is a controlled substance both at a State and Federal level. The licensing, approvals and regulatory documentary procedures are exacting and costly. The production process of Detoxadine has a stabilizing effect on the elemental iodine, making it far more bioavailable than other "nascent iodine" products which can exhibit toxic effects (e.g. Cytotoxicity). Bound forms of iodine must first be separated, clarified and purified from other binding components or impurities into a USP-grade (US Pharmaceutical), mono-elemental iodine as certified USP resublimated iodine crystals. In this purified crystal form, iodine is a highly reactive and toxic substance. However, when the purified USP iodine crystals are subjected to a proprietary process it becomes nano-colloidalized and transforms into a non-toxic form of elemental nascent iodine, also referred to as monoatomic iodine, without the addition of iodides! Supplement Your Iodine Requirements Today With Detoxadine!! 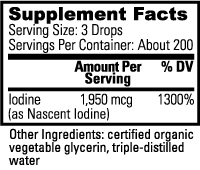 Nascent iodine is the most effective supplemental form of iodine. It is an atomic form of iodine with an incomplete number of electrons, giving it a high electromagnetic charge. The body can absorb and use nascent iodine easily for metabolic and detoxification processes. More gentle and stable than alcohol, certified organic vegetable glycerin is the best solvent base for Spagyrex® formulations. Purified water is one of the best neutral carriers. It’s effective, gentle, and, unlike alcohol, appropriate for everyone. Take 3 drops by mouth, immediately follow with purified water and swallow. Use once daily or as directed by your healthcare provider. Consult your healthcare provider before taking if you are pregnant or nursing, have thyroid or cardiovascular issues, or have other medical concerns. How are Iodide and Iodine Different? Is There a Link Between Iodine Deficiency and Autism? Iodine in Salt: Why Is It Added? Can Iodine Help With Hair Loss? What is the source of the iodine? I don't have a thyroid gland, do I still need iodine? Is Detoxadine safe for individuals who have allergies to iodine? Should people with Hashimoto's Thyroiditis or Graves take Detoxadine? Should I discontinue any prescriptions once I start taking Detoxadine? How many milligrams of nascent iodine are in one serving of Detoxadine? What is the shelf life of Detoxadine? How much iodine is too much iodine? Is Detoxadine an 'iodide,' like potassium iodide? Can I give Detoxadine to my pet? Don't see your question? Contact us! Historically, nascent iodine has been made using electricity to break iodine’s diatomic bond and create a single, highly energized atom. However, it is difficult to use this method on the scale necessary to produce sufficient quantities. It also does not leverage the latest technological advances. Global Healing Center has developed proprietary technology to create nascent iodine by using Thermodynamic Pressure Sensitive High Energy Sound Pulse Nano-Emulsion Technology. This technology is the result of years of research and collaboration between top Russian Physicists, the Global Healing Center production staff, and Dr. Edward Group. The end result is a highly-charged, bio-available, stable form of nascent iodine. Global Healing Center is the only company that doesn't source iodine from the sea. Our USA-based production facility derives the iodine from a salt solution that is extracted from a geologic formation approximately 6,000-7,000 feet below the surface of the earth. This salt solution is 300 million years old and contains high concentrations of “iodide” that is extracted. The iodide solution undergoes a series of purification steps to convert it to iodine and separate the non-volatiles and other halogens. If you do not have a thyroid, then iodine is not necessary to create thyroid hormones. However, that doesn't mean the rest of your body doesn't need iodine -- it does. Iodine is necessary for breast and prostate health (the second largest iodine storage sites after the thyroid). It is also used by the adrenal glands, parotid glands, mucosal lining of the intestines, uterus, ovaries and more. It is a necessary nutrient for maintaining healthy cell life cycles. The P53 gene requires iodine to function. P53 has been called "The Guardian of the Genetic Code" and is responsible for the apoptosis process of damaged cells. Thyroid or not, there is no question that iodine is required by the human body to function properly. If it is the iodine content of kelp that the individual is sensitive to, then all iodines should be used with great caution. If it is the polysaccharide matrix in which the iodine is bound that the individual is sensitive to, then the iodine in Detoxadine “MIGHT” not be a problem. In either case, deferring to a natural physician is absolutely required. 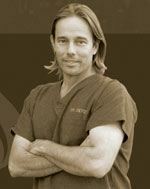 People with Hashimoto's Thyroiditis or Graves should consult their physician before taking any nutritional supplements. No, you should not discontinue any medication without consulting your prescribing healthcare professional. It is also recommended you separate medications at least 4 hours from Detoxadine administration. There are 1,950 micrograms or 1.950 milligrams of nascent iodine per serving of Detoxadine. The shelf life of Detoxadine is about 3 years. Acute iodine toxicity is rare and usually only occurs when many grams have been ingested. Symptoms may include burning of the mouth, throat, and stomach, vomiting, increased heart rate, nausea, intermittent ringing in the ears, diarrhea, weak pulse, shakiness, feelings of panic, or a profound disruption of sleep patterns. No, Detoxadine contains pure iodine in glycerine solution. It is not an iodate or an iodide bonded to another element, like potassium iodide (although when iodine ion occurs alone, it is called an iodide). When iodine is bonded to another molecule, it is harder for the body to use. Detoxadine is a special non-toxic transformed mono-element nascent iodine product. In other words, the only mineral Detoxadine contains is iodine! This means easier uptake and utilization. Pets can take 1 drop per day for every 25 pounds they weigh. Detoxadine can be administered directly in the mouth or added to food.